Over the last year or so, this blog and my (many) social media accounts have been identified by the image I've come to fondly think of as "CftC Lady". We have several things in common including a love of knitting, yarn all over the floor, a penchant for headbands, and red fluffy slippers! Things have been great between us. 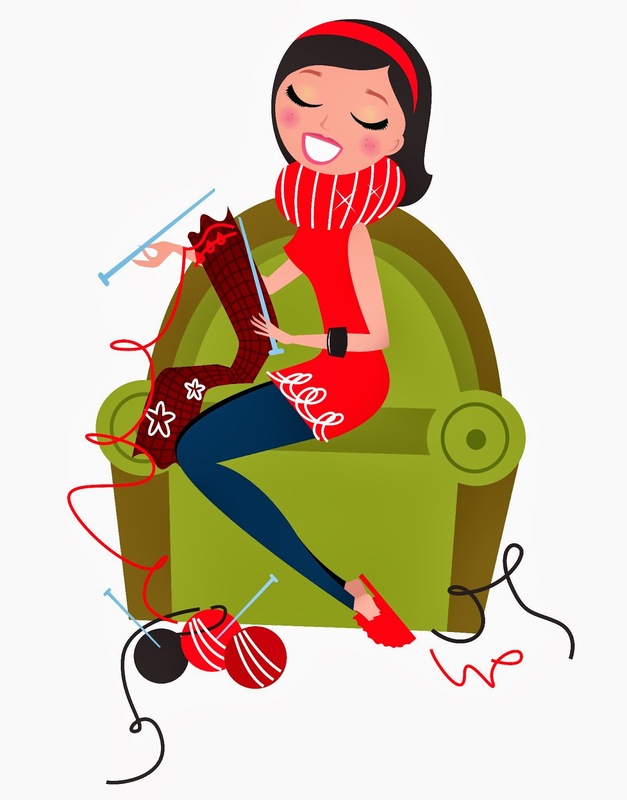 Unfortunately, as a stock image, 'my' lady started cropping up on other knitting websites and I took the decision to have something designed that would be unique. Thanks to several recommendations I was able to choose from a few great designers, and found someone* who immediately understood what I wanted and who interpreted my ideas into a cohesive and unique design that I loved at first sight. The circle and the C encompassing the yarn represent a Cwtch which is a loving hug and a special place as well as being the name of my craft room. 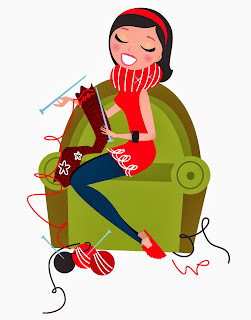 The yarn and stitches speak for themelves and, of course, it's red. The main font is a nod to my love of 50s-style Americana (just like my (red) PT Cruiser). For all these reasons, I am delighted with it. From previous discussions on the Facebook page, I know that some readers are fond of the lady, and that some of my most regular and loyal blog friends may not be totally happy about her retirement (you know who you are!!!) but I hope you will all welcome the changes and enjoy the latest facelift. The new blog template is being installed by Blog Me Pretty on Etsy. Some older posts may look a little odd while the format is checked, and I've removed some pages for reformatting too - please bear with me, and if there is anything you are looking for but can't find, just let me know. I hope to be back with a finished object tomorrow. See you then! * The designer happens to be the 'siginifcant other' of one of my favourite bloggers - Wink from A Creative Being, and I would recommend him if you're looking for a graphic designer. His online portfolio is being updated but in the meantime, he can be contacted via Wink. Your new "look" is perfect :) and you have the security of knowing it will always be yours! Your new design, however, is fabulous and I totally see the connection with 50's style Americana! I love the colours as well as the elements contained in the design. Congratulations! Thanks! I know what you mean about the lady, last night (before the new logo went live) I had a little wobble for the same reasons. It seems that the feedback today has been really positive so that's great. Looks lovely Hon! Clean Fresh and Knitty goodness. I am liking the new look :) It will be good to be unique! I like the new logo. I completely understand why you would want something unique to you, especially you are famous from US podcasters talking about you. Sometimes an image change can be really empowering. I know when I did it, it really helped clarify for me the way I wanted to present myself online and what I wanted to create there. Hahahahaha, thanks Chrissy! I think that's a rewlly valid point, and as I'm planning to put more into the blog come September, that should be a really great starting point. You gotta do wha cha gotta do. You are such a unique spirit, Sarah. It must be represented right and it totally is with this new logo! It's so cool, fresh, modern, and awesome. And well done on your podcast mention, I can totally imagine your surprise but any recommendation will have been well deserved!